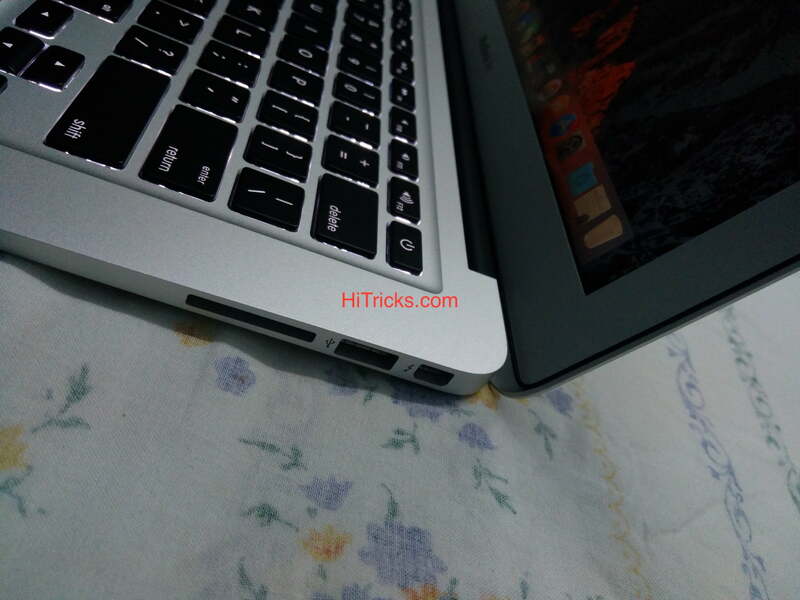 MacBook Air: What does it come to your mind when you hear someone using MacBook Air? Umm, some real premium laptop used by rich people for showing off ??? Well, I don’t deny that Macbooks are always in the news for being one of the most expensive laptops available in the market. MacBooks are undoubtedly one of the most portable premium laptops available in the market too. They help to get things done fast with an unmatched performance. So, this year 2017, during the festive season sales, I found this MacBook deal on PayTM. In fact, combining with the offers, it was so lucrative that I couldn’t resist myself. I ended up purchasing a MacBook Air (256 GB) of the 2017 variant. I got it for around 58k. Along with that, I got a 1TB Hard Disk, and few coupons worth 5k. I bought it immediately. The MRP of this Laptop is around 98k, but it generally goes on sale for around 75k. Getting it at 58k in PayTM is a wonderful deal for me. If you want to buy Macbook Air, don’t worry I will provide the links to get the maximum discounts on your purchase at the end of this post. Keep on reading to find out. Earlier I used the HP R-014Tx Model, A Windows Lappy. So, obviously, switching from Windows to Apple was a decent journey for me. So, today, in this post, I am going to write my first impression about the MacBook Air, which is a entry level Apple Laptop. Well, I am not going to discuss about the specifications and compare them with the available market products. 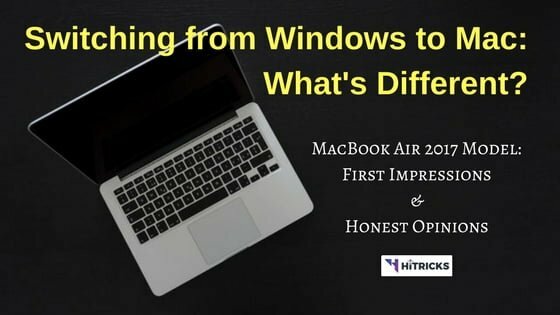 Rather, I will discuss about my actual experience with the MacBook and the changes from Windows. If you are currently on Windows and planning to buy a MacBook, you should definitely find this post useful. Here’s what’s changed for me. 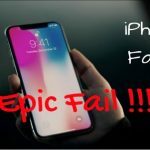 YOU MAY ALSO LIKE: Apple iPhoneX FaceID Unlock is an EPIC FAIL! PayTM did a nice job of packaging the laptop safely, thanks to the Seller. 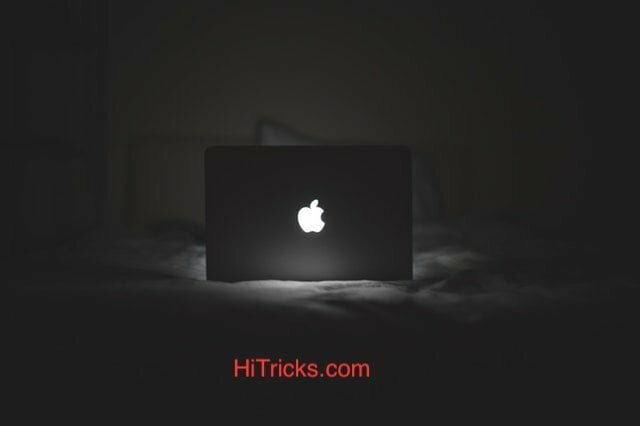 When I took out the laptop, the first thing that gained my attention, apart from the glowing Apple Logo, is the width of this Laptop. The build of this Laptop is ergonomic, and you start feeling it right from the beginning. The width is thicker on the further edge and slowly narrows and becomes thinner and thinner as it approaches on your end. This gives the laptop a gentle slope on which the keys are placed. So, typing on the keyboard gives a nice feeling. The edges are round and very finely shaped. The silver color also adds to its premium look. My earlier laptop was a 15.6 inch model. And this one is 13.3 inch. So I wasn’t sure about how much small would be the the MacBook Air screen compared to my Windows Laptop. But, to my surprise, the laptop screen didn’t feel so small to me. The length and breadth of the screen are so nicely adjusted that you won’t complain about it. After you start using it, you will notice that the icons, fonts etc are slightly smaller than the regular windows ones, thus adjusting the smaller screen perfectly. You don’t need to worry about the slight small size a bit. Overall the MacBook Weighs just around 1.3kg. And it is perfectly balanced so you won’t feel the weight much if you are keeping it on your lap and using. In fact, it is truly a laptop in that sense that you can use it on your lap as long as you want and it won’t hurt your legs. Trust me, it is much lighter than a average 15.6 inch Windows Lappy. In terms of portability, this wins against just anything. Another thing, you can easily lift up the laptop screen with just 1 finger. It is indeed light. 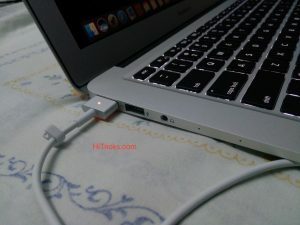 Apple has introduced the New USB Type C ports in their 2017 models of MacBook Pros which needs every user to buy adapters to connect it to regular USB ports. They call this as Future Proof. But, well, we are not used to Type C yet. You won’t find much options for buying a USB Type C Hard Disk, or mobiles with Type C chargers. So, you have no option than buying adapters for MacBook Pros. Luckily, they didn’t ditch the regular USB A ports from their MacBook Air models. So, with this MacBook Air, you don’t need external adapters. You can directly plug in USB inputs to the Mac. You get two USB 3.0 ports and a 3.5mm Headphone Jack. Wait, its not over yet. You also get a SD Card reader slot on the right (Regular SD Cards, not Micro SD Card). This will help you scan photos from your DSLRs easily. So, you don’t need to worry regarding the ports at all. There are two noise cancellation mics on the left side, which does a decent job on recording your voice. The MacBook supports 3.5mm Headphone jack, so you can continue using your own set of headphones. This is yet another port Apple ditched recently on their MacBook Pros, but, kept on the Air models. And, to be honest, this is extremely useful stuff. The charging adapter is Magnetic and it attracts and connects to the port automatically as soon as you bring it nearby. Not only it saves time, but there is no possibility of disconnection or weak connection. Also, it prevents your laptop from falling off if there is a sudden accidental pull on the cable from bottom. It nicely detaches off from your laptop keeping it safe. I am in love with MagSafe. Regarding Charging time, it is pretty fast too. On my first usage, I put it on charge at 9.30pm when it was on 10% battery. It charged fully before 11pm. So, a mere 90 minutes for 90% charge is quite fast. On my regular usage, I won’t drop it to 10%, as I want to preserve some charge cycles. I usually plug it in between 20 and 30 percent. Coming to the keyboard, the keys give a decent feedback against each stroke. 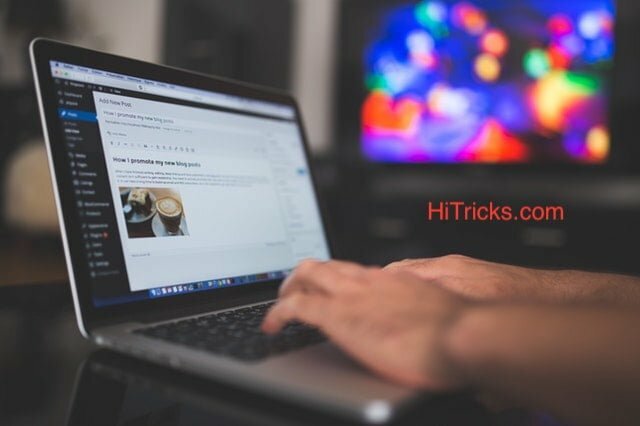 Anyone coming from Windows keyboard will notice one big difference: The Windows key is replaced by a Command Key, and there are minor changes and adjustments to the Alt key and Control Key. During typing also, you will notice that the shortcuts you used on windows have changed here. Nope, its not a major change and you don’t need to re-memorize everything. The functions you did with Control Key has been remapped to the Command Key here. For example, ‘Select all’ becomes Command + A, ‘Copy’ becomes Command + C, ‘Paste’ becomes Command + V and so on. Here’s a picture of the Mac Keyboard so you can see the key positions. You don’t need to struggle hard to adapt to this change. In fact, this is more ergonomic. If you are into touch typing, there are bumps on the F and J keys so you can type easily without seeing the keys. And don’t worry, it won’t touch your trackpad accidentally even once. The key heights are quite balanced so you get a good feel while pressing them down. The keys are backlit too. Coming to the trackpad, again, if you are coming from Windows, you will notice some changes here. Firstly, there are no left and right keys like windows. But, that doesn’t mean that it has no right key function. The trackpad works faster using gestures. In windows, the only gestures we used were mostly for scrolling up and down, and zooming in and out. Here, however, you get a few new gestures, like double tap, tap with two or three fingers, swipe left or right etc. The trackpad supports multi touch, so you can utilise additional fingers for more gestures. By default, you have to press the trackpad for clicking, but, in the settings you will get option to set tap for action, so you don’t need to actually press it. If you continue using it for some days, you will notice that you are getting stuff done faster. One good thing about MacBooks is that you don’t actually need an external mouse to work. You can pretty much do everything conveniently using the ergonomic and user friendly trackpad. The trackpad also feels much smooth than the Windows trackpad. This is another thing I loved about the MacBook Air. I won’t go into much discussions here. The MacBook Airs haven’t got the most vibrant looking Retina display on their MacBook Airs. It is even lesser than Full HD display. You won’t feel a thing if you just keep yourself limited to browsing, editing docs, presentations, media consuming. But as soon as you start video editing or picture editing, you will feel the need to use a better display. Macworld has written an Article on Retina display and the differences between a regular and retina display. You can read it here. The display used by MacBook Air is 1440 x 900 pixels. Though I keep myself limited to basic tasks only, on this laptop, I genuinely have a complain towards Apple for not including the Retina displays on the Air. Its not always about usage pattern, sometimes, its about staying above the competition in the existing market, and I feel they should have included the retina display. Anyways, don’t remain confused regarding the display. If you are heavily into editing, you are most likely not going to choose this laptop in the first place. And in the other general stuff, it won’t make you down. Most of the time, you won’t notice it at all. If you are not into editing but still going for a retina model, I would ask you to stop. The retina models cost a lot. See the price difference between a retina and non retina model. While you can grab an entry level MacBook Air at 45k (during discount periods), the entry level Retina Models cost around 130k. So, its not wise enough to go for retina if you are not into editing. However, if someday Apple decides to include Retina display on the Airs, that will make this range even stronger. One more thing, the display ratio is 16:10, thus giving a better viewing dimension than the 16:9 conventional ones. Ahh! The most vital thing about a MacBook, it makes your life easier and faster. MacBook is designed to give you the best performance possible. First things first, while the MacBook pros are updated with latest processors, MacBook Air is still using the old i5 processors with just a RAM upgrade from 4GB to 8GB. But, on the regular day to day tasks you won’t feel any lags at all. Apart from the hardware, the SSD storage and the MacOS RAM optimization helps a lot in getting the best performance possible. Be it working on docs, or editing a presentation, or browsing, or media consuming, or coding, you can do it lag free on this model. The only place where it lags a bit is Photo and Video Editing. Final Cut Pro, the popular Mac OS X video editor, loads significantly slow on this model. Heavy photo editors like Photoshop is slow too. But they are slow does not mean they can’t be used on this model. You can work on them easily. Just the video processing and rendering time will be much high. If you need editing as the first priority, MacBook Air isn’t your model. But, if you do editing occasionally, then, you can pretty much get used to it. Even better, you can use other lightweight editors available to make it a smooth experience too. However, other editors have limited features to use, which might be sufficient for you if you use light editing. But for a mainstream editor, please pay up a bit more and buy the MacBook Pro models. They come with better and faster processors and will make your work easier. Summarising it up, if you are a student, or a teacher, or work in office, or a blogger, you can safely buy this laptop and squeeze out the best performance from it. However, if you are a designer, a youtuber, or a video editor, please don’t buy this laptop. It is not meant for heavy usage. One big difference between MacBook and other laptops is that they offer better battery life than any other 15.6 inch lappy. There are reasons behind it. Firstly the SSD are battery friendly. Secondly, the software bundled by Apple are a lot optimized in using lesser resources thus preserving the battery life. Secondly, the display isn’t Retina. It is less than Full HD which makes it consume lesser juice. Again, between the Air and the Pro models, the Airs give at least 2-3 hours more battery life, as it is meant for portability. Also, the Pros have Retina display which reduces an hour of battery life more. For regular usage, it will give you around 10-13 hours of battery life, depending on your usage pattern. For heavy usage, like editing, it will drop to 5-6 hours. But, to get the most out of it, I recommend you to switch from your old Windows habits to MacBook counterparts. The first thing is about browser. Most of us on Windows use Chrome or Firefox. Actually the default browser provided by Windows is so bad, that we have a tendency to download Google Chrome. This led to the huge popularity of Chrome. However, in MacBooks, you get the Safari Browser by default. My suggestion would be to switch to Safari from Chrome. Yes, I know its hard. You have your bookmarks, your one click websites, your extensions, and most of all, your passwords stored on Chrome. Well, there are solutions available. Most of the extensions are available on Safari as well, so you need not worry about that. For passwords, luckily, you can import it to Safari via Lastpass. Just download the Lastpass software for Windows, register, create your vault, and import all your Google Chrome passwords to Lastpass vault. Anyways, the next thing about adapting to Mac is using their default Word, Excel and Powerpoint counterparts, namely Pages, Numbers, and Keynote. Yes, the settings are a bit different over there, but once you get yourself adapted to it, you will feel at home here. Once you start using them actively, instead of switching to Microsoft Office, you will notice the difference in both performance and battery life. And trust me, those softwares are developed by Apple with care, they won’t disappoint you. In fact, not only they are better at battery and ram management, they are more user friendly and less complicated too. Until now, you have just heard of Siri, mostly in memes! But once you start using Siri, you will know its full potential. First thing is it never misses any word you say. Second thing is it obeys your instruction, as long as you tell it in a nice and easily understandable way. Siri is smart and I found it helpful in many situations. 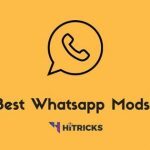 You can get answers by asking any type of questions, cricket scores, weather, news, wiki etc and you can also ask it to schedule meetings, reply to mails etc. It also does a decent job of searching files for you. You can also teach Siri custom commands. I am quite happy with my experience with Siri. I haven’t used it much, except when I needed it, and it helped me accordingly. Like, I was confused where to find my display settings, and I asked it to Open Display settings, and it did. Instructions work fine if you speak them clearly. So far, it does not understand any Indic languages, so you need to instruct it in English only. MacBook uses Solid State Drives (SSD) instead of Hard Disk Drives (HDD). They are faster, loads quicker. But they are costlier too, and you only get 128 and 256 GB storage variants. Indeed, they are pretty low. If you are coming from Windows, most of you will be using 1TB storage in Windows. Switching from 1TB to such a low storage is a difficult thing. The solution is a External Hard Disk. You have to buy one, if you don’t have one already. Earlier, you could just download a lot of movies, music etc without worrying about storage. But, now, you have to push all media into the hard disk and only keep your documents on the MacBook. Macbook File Manger is quite different from the Windows file manger and even the Linux File manager. It if called Finder. Firstly, there are no C Drives, D Drives etc. Everything falls under one single drive. Secondly, there is no Root or Home (theoretically, there is, but you don’t have access to it), you just see Documents, Downloads, Applications, and All my Files section. You can create new folders on the ‘All my Files’ section and arrange your stuff. Thirdly, you can use the Finder to look up for pretty much anything you store. Fourthly, Deleting any software is easy. You don’t need to go through any tiresome uninstallation process. Just move it to trash, and you are done. Later on, you can empty Trash to permanently delete them. Fifthly, there are tags of different colours like Red, Yellow, Orange etc. You can categorise your files under different tags. The Apple App Store provides you a lot of free and paid software (as well as games) that you can download for your work. Most of them are productivity software and should help you out with any professional work you need. However, there are entertainment apps too. I am not going into details here. If you know what you need, you can find them here with just a. Search. This is a full-featured Audio Editor as well as Music Creation App made by Apple, for music enthusiasts. It provides access to a lot of instruments. Also, you can use your voice to record music. You can create new music here. You can plug in your USB keyboard (talking about the instrument, not the keyboard you use for typing :p ) and play music and take it to the software for further editing. For professional Music makers, this software is tremendously helpful. Like Google offers Google Drive, Apple offers iCloud for all users. It gives free 5GB storage for backing up your documents, pictures, videos etc. If you don’t want to backup, you can disable them the first time you configure your iCloud account. While you use the Pages, Numbers and the KeyNote apps, you can set iCloud to auto-save it to your account, so that you can continue editing online or from your other devices. iCloud also supports Windows, so you can get your files both in windows and MacBook. iCloud also backs up your contacts etc, and puts them under one roof. Booting up an Apple MacBook is incredibly fast, thanks to the SSDs. You can get started under 10 seconds. Shutting down takes around 6 seconds for me. If you want something which boots up as soon as you need it, MacBook will never disappoint you. But the real gem lies in the Sleep Mode. You pull down your laptop screen and it will go to sleep mode. Pull it up anytime and enter the password, you will be back at the same place you left instantly. No windows laptop is as fast in restoring everything as it is. The experience is magical. 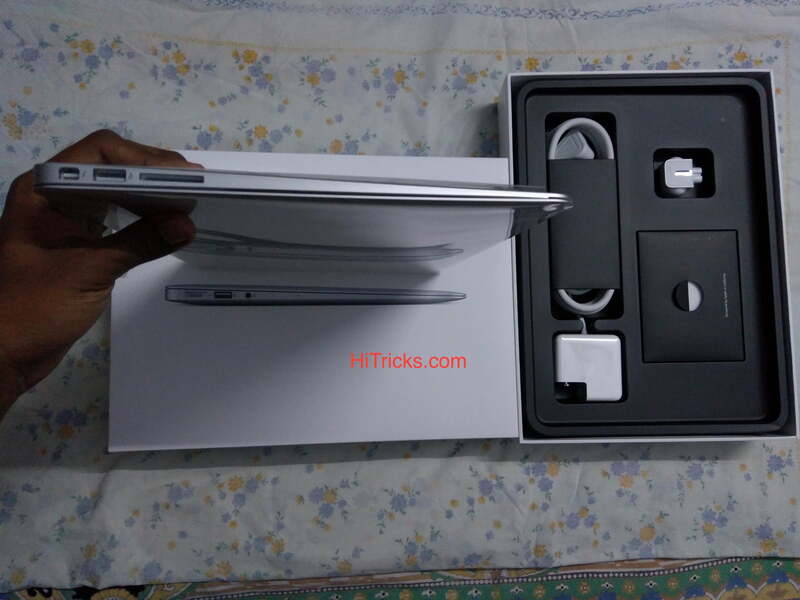 Macbook is one of the costliest laptops out there in the market. The Airs are their entry level laptops and their original MRP is around 77k for the entry level. At 77k, you can almost get a premium laptop with decent specs. So, ultimately everyone asks this question, is a MacBook value for money? Its no surprise that MacBook is designed to be fast, give good battery life, portable and user friendly. But, is it wise to pay such a hefty amount to buy a Macbook? The answer is clear: NO, MacBook is NOT a value for money product, at least at its MRP. I would never recommend you to grab Apple products at their MRP as soon as they launches. That is pure idiotic. You will end up spending a huge amount of money, getting undervalued stuffs. But that doesn’t make MacBook a bad choice. I would recommend you to go and grab it as soon as you find some discounts available on the product. Well, I myself purchased the 256GB variant for 58k, the 128GB entry level was on sale for around 47k. At that price, its value for money every inch. You will notice that the price of Apple products keep on decreasing every year. So, you can take a shot at some product and grab it as soon as you spot an offer. Who Should Buy MacBook Air? 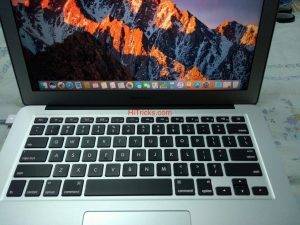 Students, teachers, office-goers, businessmen, web developers, writers, bloggers can easily go for MacBook Air and get the best performance and battery life. 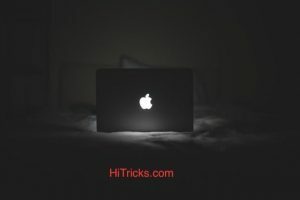 Who should buy MacBook Pro? Video Editors, Graphic Designers, Engineers who need a computer for their project, YouTubers etc for go for MacBook Pro and never worry about performance and RAM availability. Its the fastest thing available in the market. 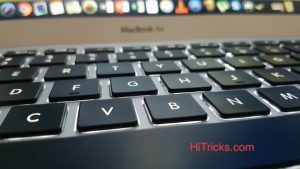 Who should not buy Macbooks? If your primary needs are Gaming, then you should not buy Macbook. Yes, the intense hardware of MacBook Pro is efficient at handling games, but the controls (both keyboard and trackpad) are not optimized for gaming. Windows does a better job here, so it will be a smart move to purchase a Windows lappy instead. If you are buying a laptop for the first time, then also, think twice about going for a Macbook. Leaving those who has got a lot of money, others first think what do you essentially need from a Mac. A windows lappy can pretty much handle anything that a Mac does, but with less speeds. If you can work on a slow computer, then getting a old generation processor lappy for 25k to 30k can also suffice your needs. 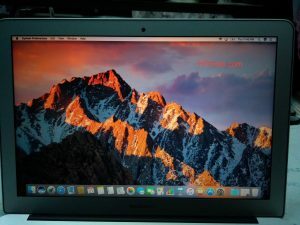 But if you are eager on spending a good amount and getting the best performance possible, MacBooks is the only thing you need. Also, let me confirm, at the discounted rate of 47k, MacBook is a lot better than all other Windows laptops of that range up to 60-70k. But yes, at the original MRP of 80k, you might consider getting a better hardware and stick to Windows. 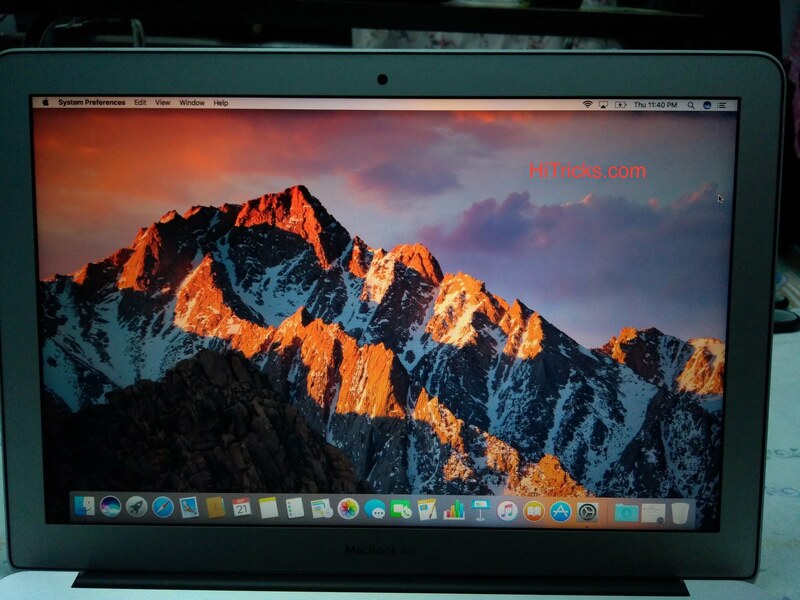 MacBook Air: Where to Buy? 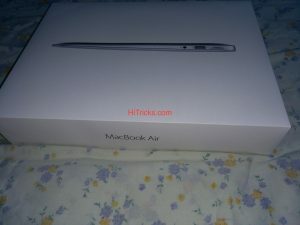 So, here’s the big question out there: Where to Buy the MacBook Air to get the maximum discounts? The thing is that unlike other products which have a fixed pricing, every retailer sells MacBook air at different prices. And sometimes, the price difference is so much that you keep on wondering where to grab yours from? The base 128GB model retails for as high as 80k on some stores to as low as 50k on some. So, you need to be extremely open minded while grabbing your Macbook. If you go through the listings on e-commerce websites, you will find that PayTM is giving the maximum discounts via Cashbacks. I myself had bought it from PayTM. You will often find Rs10000 to Rs14000 cashback codes over there. When you buy you need to pay up first, the cashback will be credited once your item gets shipped. Also, choose from Brand Authorized Sellers only. We occasionally offer some additional discounts on MacBooks (both Air and Pro). We have some very good friends out there who are in touch with some authorized resellers of Apple Products. 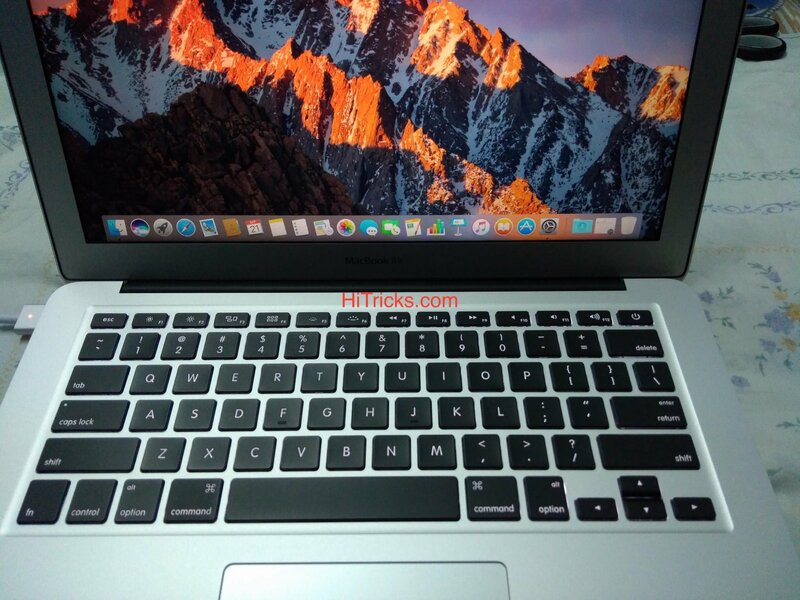 Occasionally, we offer some exclusive discounts on purchase of Macbooks. These discounts will be better than any other online or offline stores, thats guaranteed for sure. If you are in hurry or have emergency need of buying Macbook in the cheapeest price right now, then go with the PayTM links I listed above. But if you don’t mind waiting for a few days to few weeks, then you might want to wait to buy a MacBook using our exclusive discounted deals. Just fill up this Google Form and we will contact you back during our next offer period. I guess I have covered pretty much everything about the changes between Windows and Mac, including my initial impressions. I currently run both a Windows and a Mac laptop, so I have tried my best to show you the stuff worth mentioning. These are all that attracted me during my usage. These are the stuff worth mentioning. If you need any more information about MacBook Air, then you can comment them below. I will try to help you out. Thanks for reading my post on MacBook Air Review. Do share this post with your friends and help them get a clear idea about the MacBook Air before actually grabbing it. Use the social share buttons below. I, personally, have no regrets on buying the MacBook Air and I will recommend every professional to grab one for their work purpose. You will definitely love it. That’s all for now. I will be back soon with another amazing update. Till then, stay tuned! If you are going to purchase the MacBook Air, you need the perfect Accessories to protect it. Here are 3 things I recommend you to buy as soon as you place your MacBook order. Screen Guards: Buying screen guards is a must. You can’t just use it without a screen protector. Keyboard Guards: Keyboard Guards are a vital need for your MacBook as well. Not only it protects your keys from getting damaged, it also prevents dust particles to enter between the space of your keys. Laptop Sleeve: If you are going to travel a lot or take your Mac outside regularly, then you should consider using a laptop sleeve to protect it. Also, even if you don’t take it outside regularly, use some sort of soft cloth to clean it always. Else, get the sleeve, it will also prevent your Mac from catching dust. Check out this item from Amazon: Click Here. Its a combo bundle of a Laptop Sleeve, Keyboard Cover, Screen Guard, Touchpad Protector and Dust Plugs. This costs around 2k but it will give your MacBook the complete protection it needs. If you want just the Screen Guard, you can Click Here to buy. It is a screen guard from Sace. I have used mobile screen guard from Saco and have admired them. They are of great quality. If you want just the KeyBoard Guard, you can Click Here. For only Laptop Sleeve, I can’t suggest any other brand other then AmazonBasics. I am using it myself for my Macbook Air. Click Here to buy. Sir, If i buy from PayTm then can i transfer the cashback money to my bank account ?? Great review buddy, specially because it’s from a first-hand and fresh perspective. Although, What is the 1 thing that you can do on a Mac, and isn’t possible on a normal 25-30K Windows PC? Not to mention we “Can’t” play games on a Mac. What I’m asking is, is it worth spending 2-3X the price of a general Windows only to be able to “not” play games, or to experience lagging Photoshop like editors? They don’t lag on a 25-30K Windows PC, right? Congrats Bro 4 switch 2 macbook!!! What about warranty. How many years and can it be extended? Is its Warranty covers accidental damage Protection? Is this onsite or carry in to service center?